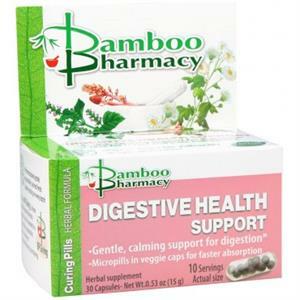 Digestive Health Support is our classical herbal formula based on Kang Ning Wan, also known as Curing Pills. For centuries, people have relied on this comforting formula for its ability to help support their bodies’ digestive system and the absorption of essential nutrients. Magnolia, chrysanthemum, and mint are combined with other herbs to provide natural, soothing digestive system support. Our East Earth Trade Winds herbalist says that this formula is traditionally used to alleviate indigestion, nausea, diarrhea, and gastric hyperacidity. It is also said to be helpful for motion sickness. Dosage: Take 3 capsules 3 times daily as needed or as directed by your health care practitioner. Cautions: For children under 12, consult a physician before use. Contains wheat and tree nuts. Keep out of reach of children.